Reference number for this case: 10-oct-54-Cussy. Thank you for including this reference number in any correspondence with me regarding this case. It is by the sci-fi writer and ufologist Jimmy Guieu that this case surfaced in 1956. It was then summarized by Guy Quincy then Jacques Vallée who does not quote Jimmy Guieu as the source, then many others copied Vallée's summary. Guieu indicates that he investigated two witnesses "absolutely worthy of faith", Daniel Grapin and François Bolatre, assistant-geometrician, and did not have "the feeling that they had dreamed" about an incident on October 10, 1954 at 2 o'clock in the morning, between Epoisses and Toutry in the Côte-d'Or. The two witnesses drove Mobylettes [light motorcycle] by a slightly covered weather, and Guieu quotes François Bolatre as telling him that they suddenly saw an orange sphere of an apparent diameter equal to that of the full moon, which went up and down in the sky, a craft that appeared and disappeared alternatively, whom they lost from sight. 15 kilometers further, they saw an orange gleam in the middle of the road and noted while approaching that it was an enormous dazzling sphere of 3.50 meters in diameter approximately, which brightly illuminated the road on which it was posed. Amazed, they stopped, and suddenly realized that the sphere approached, advancing towards them without rolling, rather slowly initially, then, imperceptibly, faster and faster to rush right at them. Frightened, they quickly turned their Mobylettes and started full throttle in the direction from where they had come "and this, without looking back!" François Bolatre specifies that no time did the thing exceed them, and that they thus unaware of the direction it flew away or the time it rose, and that the sighting had lasted 3 to 4 minutes approximately. Jimmy Guieu comments that it "would be obviously too easy to say the two Messrs hallucinated" "like the hundreds of other witnesses of landings of flying saucers", a solution which he indicates was chosen by the scientists but does not satisfy him. He adds that the official and allegedly scientific claims that flying saucers are dreams are suspicious and are refuted by the fact that people continue to see flying saucers. Far from saying these two gentlemen hallucinated - a condition in which two "hallucinating" persons have no chance of experiencing the same hallucination, I show in this file that the orange sphere was, as it was easy to guess, the moon. Science fiction writer and ufologist Jimmy Guieu indicates that he investigated two witnesses "absolutely worthy of faith", Daniel Grapin and François Bolatre, assistant-geometrician, and did not have "the feeling that they had dreamed" about an incident on October 10, 1954 at 2 o'clock in the morning, between Epoisses and Toutry in the Côte-d'Or. The author indicates that on October 10, 1954, between Epoisses and Toutry, about 13 kilometers from Semur-en-Auxois, two men saw on the ground a luminous sphere of 3 m 50 in diameter. 225) October 10, 1954 Epoisses (France). Between Epoisses and Toutry, Daniel Grapin and Francois Bolatre, topographers, saw a luminous sphere 3.5 m diameter on the ground near Route N454. (Quincy). The author indicates that on October 10, 1954, between Epoisses and Toutry, within approximately 13 kilometers of Semur-en-Auxois, two men saw a luminous sphere of 3 m 50 of diameter on the ground. The two authors indicate that on October 10, 1954, at 02:00, close to Cussy-les-Forges in Yonne, the weather was slightly overcast. Two motorcycle riders, Mr. Daniel Grapin and Mr. François Bolatre, were coming from Epoisses and driving to Toutry on the RN 454. In front of them, as they have just climbed a small hill in crossing of a wood, they discover an orange sphere, the size of the full moon, which is busy with a strange movement of elevator in the sky like a spider going up and down along its string. The craft disappears again behind natural obstacles. "But 15 kilometers further, tells François Bolatre, whereas we exceeded Cussy-les-Forges, we saw an orange gleam in the middle of the road. While we got closer, we realized that it came from a dazzling sphere of 3.50 meters in diameter approximately landed in the middle of the road. We stopped, vaguely anxious. Suddenly, we realized that the sphere approached us slowly, without rolling. Then it increased speed imperceptibly and spun right on us. Frightened, we made turned back and fled at full throttle, without us looking back. At no time did the craft exceed us. Thus we did not see how it moved away." Messrs. Daniel Grapin and François Bolâtre, a surveyor, ride on a moped between ESPOISSES and TOUTRY, COTE D'OR. They perceive in front of them, posed on the road, a luminous sphere of 3m50 of diameter, of orange color. This is Case No. 225 in the book "A CENTURY OF LANDINGS" by J. VALLEE; it is also cited on page 4 in LDLN No. 101 bis. The facts are slightly different. 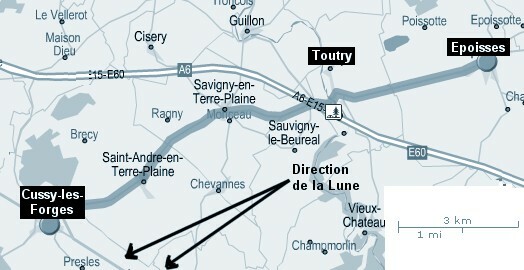 Messrs. Daniel GRAPIN and François BOLATRE come from ESPOISSES and drive in the direction of TOUTRY, on the RN 454. In front of them, when they just climbed a small hill, they discover an orange sphere, the size of the full-moon, which is engaged in a strange movement of elevator in the sky, "like a spider going up and down along a wire". The craft disappears behind natural obstacles. But 15 km away, while the witnesses have just passed CUSSY-LES-FORGES (YONNE), they see, posed on the road, an orange sphere, dazzling, 3m50 in diameter. The witnesses then make a U-turn: "At no time did the machine overtake us, so we did not see how it went away." (FACE AUX EXTRATERRESTRES by Charles GARREAU and Raymond LAVIER, pp. 46 and 47). In this case the facts unfold as for that of LOUBLANCE (Deux-Sèvres)-TESSOUALE (Maine-et-Loire), straddling two departments: on one side the COTE D'OR - observation of the object in flight between ESPOISSES and TOUTRY; on the other YONNE - landing of the U.F.O. on the road, at the exit of CUSSY-LES-FORGES. Note: Figuet continues with a lesson on respect for the place names spelling, which would have been better if he had not written "Espoisses" instead of "Epoisses". 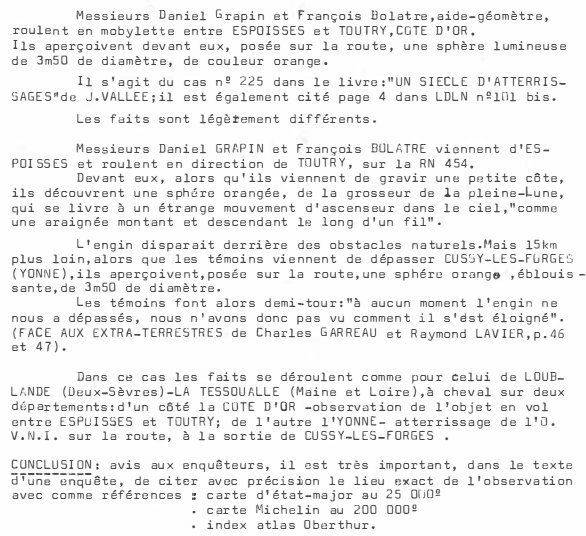 The authors indicate that on October 10, 1954, at 2 o'clock a 4 minutes sighting took place on National road N454, between Espoisses and Toutry and Cussy-les-Forges, the witnesses being Daniel Grapin and François Bolatre, an assistant-geometrician. These two witnesses were riding motorcycles by a slightly covered time, when they saw an orange sphere, the size of the full moon, which went up and down in the sky, appearing and disappearing alternatively, then disappearing from their sight at the end of a few moments. When they were at the exit of Cussy-les-Forges in the Yonne, they noted the presence in the middle of the road, of an orange gleam, which came from a dazzling sphere of 3.50 meters approximately, which brightly illuminated the road on which it was posed. They were amazed, stopped and noted that this object approached them initially slowly, then more and more quickly. They were frightened, turned their motorcycles in direction of Cussy-les-Forges, and fled without looking back. The authors indicate that their sources are the Vallée catalogue, case 225; Jimmy Guieu in Blackout sur les S.V., pp 208-209; C. Garreau and R. Lavier in Face aux E.T., p.46-47; Quincy; and U.F.O.-Informations, the bulletin of the A.A.M.T., #15, pp 5-6: OVNI et Géographie by M. Figuet. Between Epoisses and Toutry, the two witnesses saw a luminous sphere of 3.50 nm of diameter posed on the national road 454. D954/TOUTRY><EPOISES,FR:2/MC:3.5M LUMn GOES ^+^/SKY:SAME/SIMLR SITS ON ROAD! Godelieve van Overmeire indicates that in 1954, on October 10, in France, in Epoisses (Côte d'Or), "Between Epoisses and Toutry, topographers Daniel Grapin and François Bolatre saw a luminous sphere 3.50 m in diameter posed close to main road 454. " The source for this is indicated as "Quincy" and "Jacques Vallée: 'Chronique des apparitions ET' - DENOEL 1972 - J'AI LU COLL. - p. 274, 275". She indicates that another version is: "The two witnesses by motorcycle, in slightly covered weather, see an orange sphere of the size of the full moon, which goes up and goes down in the sky. It disappears from their sight at the end of a few moments. At the exit of Cussy les Forges they note the presence of a gleam, coming from a dazzling sphere of 3m50 approximately, which strongly illuminates the road on which it is posed. They stop and note that the object approaches them slowly, then faster and faster. Frightened they turn their motorcycles and flee without looking back." The source for this is indicated as "M. FIGUET/ J.L. RUCHON: 'Ovni, Premier dossier complet...' Alain Lefeuvre pub. 1979, p. 141". Between Epoisses and Toutry, Daniel Grapin and Francois Bolatre, topographers, saw a luminous sphere 3. 5 m diameter on the ground near Route N454. 1954 - In Epoisses, France between Epoisses and Toutry, Daniel Grapin and Francois Bolatre, topographers, saw a luminous sphere 3.5 meters in diameter on the ground near Route N454. (Source: Jacques Vallee, Passport to Magonia: A Century of Landings, p. 223). Between the village of Epoisses (Côte-d'Or, France) and Toutry, Daniel Grapin and François Bolatre, topographers, see 1 luminous sphere 3.50 m in diameter, posed close to the N454 (1). Luc Chastan indicates that in the Yonne in Cussy les Forges at 02:00 on October 10, 1954 "The two witnesses drive by motor-cycle by a slightly covered weather. They see an orange sphere which goes up and down in the sky, this machine appears and disappears alternatively. It disappears at their sight at the end of a few moments." "At the exit of Cussy-les-Forges, they note the presence. in the middle of the road, an orange gleam. This gleam comes from a dazzling sphere of 3 m 50 approximately, which strongly illuminate the road on which it is posed." "Amazed, the witnesses stop and note that the object approaches them slowly initially, then faster and faster. Frightened, they turn their motor-cycles in direction of Cussy les forges, and flee without looking back." The website indicates that on 10 October 1954 at 02:00 between Epoisses and "Tourtry", in Epoisses, France, "An object was sighted that had an appearance and performance beyond the capability of known earthly aircraft. One object, about 5 feet across, was observed in overcast weather by two male witnesses for over three minutes." The sources are indicated as "Guieu, Jimmy, Flying Saucers Come from Another World, Citadel, New York, 1956; Bowen, Charles, The Humanoids: FSR Special Edition No. 1, FSR, London, 1966; Vallee, Jacques, Computerized Catalog (N = 3073); Vallee, Jacques, Preliminary Catalog (N = 500), (in JVallee01); Vallee, Jacques, A Century of Landings (N = 923), (in JVallee04), Chicago, 1969; Schoenherr, Luis, Computerized Catalog (N = 3173); Hatch, Larry, *U* computer database, Author, Redwood City, 2002." The website indicates that on 10 October 1954 in Epoisses, France, "A luminous sphere, 3.5 meters diameter, was seen on the ground." The website adds: "In Epoisses, France between Epoisses and Toutry, Daniel Grapin and Francois Bolatre, topographers, saw a luminous sphere 3.5 meters in diameter on the ground near Route N454. And: "Between Epoisses and Toutry, Daniel Grapin and Francois Bolatre, topographers saw a luminous sphere 3.5 meters diameter on the ground near Route N454. And: "An object was sighted that had an appearance and performance beyond the capability of known earthly aircraft. One ball, about 5 feet across, was observed in overcast weather by two male witnesses for over three minutes (Bolatre; Grapin). *Oct. 10, 1954 - In Epoisses, France between Epoisses and Toutry, Daniel Grapin and Francois Bolatre, topographers, saw a luminous sphere 3.5 meters in diameter on the ground near Route N454. (Source: Jacques Vallee, Passport to Magonia: A Century of Landings, p. 223, case # 225, citing Quincy). In 1954 in France, ufology was a very new thing, with very few people having any notion of investigation, competences, experience and methods to determine whether a sighting report can have this or that commonplace explanation. It is in particular the case with science-fiction writer and saucer enthusiast Jimmy Guieu, who did not really bother to look for possible ordinary explanation and rather tried to promote each sighting as being that of an authentic flying saucer. The ufological context in general was indeed extremely simplistic at that time. The choices are clear-cut, well too simple, for the few investigators and almost the totality of the Press: either the witnesses are "truthful", or they are liars. The very notion that a witness can be truthful, totally honestly describing what he really saw, but that by considering his description and studying the circumstances it could be realized that what he honestly described was simply not a flying saucer as everybody interpreted in this period when saucers were reported all over France, the very notion that he might have seen a certain natural phenomenon that he did not correctly identify, was an almost non-existent notion. As regards "scientist", it is almost true that they shared the same simplistic vision of affairs. These witnesses must be liars, they are not of good faith. For a psychologist, professor Heuyer, who was largely quoted in the press, things were even clearer: people who claim to see flying saucers are quite simply the mentally deficient ones, whom he thinks would soon "contaminate" the entire nation if scientists do not put an end to this obvious psychiatry problem. One of the only scientists of the time to have alerted the public opinion on the many possibilities of confusions, by witnesses that are by no means "mentally ill" nor liars, but were simply wrong in their interpretation of what they saw, was an astronomer, Evry Schatzman, through articles published in the press. Unfortunately, at the time ufologists had decided that since he is a scientist, a rationalist scientist to make things worse, he must be wrong. They did not listen to him and did not realize that indeed, there existed just like he showed, well documented examples in which confusions, often of astronomical nature, had convinced truthful and sane witnesses that they had seen a flying saucer. Ufologists simply demonized the hated rationalist without hearing any more word of him for the next decades. Such was the state of affair in which Jimmy Guieu, single source of this sighting in spite of the innumerable rehashes in the ufological literature, approached it: either these witnesses are truthful, and then they inevitably saw a flying saucer, or they are liars or people who hallucinate. Certainly rightly, Guieu realized by hearing at least one of the two witnesses, that he could be trusted. Certainly rightly also, he did not resort to the facility which consists in uttering "hallucination" for no reason, the magical open-sesame used by the journalists of skeptic opinion to get rid without much effort of these irritating flying saucers which, they knew, could simply not exist. Guieu having discarded the "hallucination" and seeing little chance that the witness was a liar, did not seek any ordinary explanation and left it there: they thus saw a flying saucer. It would practically not be before the end of the Seventies in France that, suddenly, some ufologists, calling themselves "the New Ufologists ", discovered and read American skeptics authors such as Philip Klass and realized that all UFO sighting reports must not necessarily be sightings of alien spaceships, but can be, and are often, simple or complex confusions. Unfortunately, the New Ufologists, seized with the new debunkery craze, Monnerie, Barthel and Brucker, and their increasingly numerous followers then thought that must actually exist no single sighting report that would not be a confusion, or the occasional hoax, and proclaimed this so loudly and proudly that French ufology split in two extremes: the "vile debunkers" or "socio-psycho's" and the "gullible believers". The aforementioned "believers" thus very instinctively and very generally decided to continue to neglect the search of ordinary explanations and continued lousy investigations or the more or less honest re-copying of "classic cases", often removing important information, for example those cases of the 1954 French saucer flaps as told by Jimmy Guieu, without looking for possible commonplaces causes of these saucers reports. To now try to reconstitute the documentation and to check into these cases, little by little, is thus, for them, "disinformation" or to act as a "vile debunker." In the present case, an explanation however just screams out of the report: the witnesses, or the witness Guieu heard, described almost perfectly an observation of the Moon! He describes a sphere, and the moon is indeed a sphere. He describes an orangeish color, and the Moon indeed takes such a color in the proper circumstances - full moon in autumn low on horizon in misty or cloudy weather. He describes the diameter of the sphere as being that of a full moon; isn't this a remarkably accurate estimate? He does not describe smoke, noise, landing gear, antenna, port-hole, Martians. How could anyone miss realizing that it would advisable to check if by chance the two men simply saw the Moon? Hypothesis 1: Was the Moon at least in the sky? If not, the Moon cannot be the explanation. If so, the Moon might be the explanation. This is quite verifiable. And in fact, yes, on October 10, 1954 at 02:00 a.m. local time, from Cussy-les-Forges, the Moon was at azimuth 239° 7 ' and elevation 22° 41'. At 03:00 a.m., it is at 251° 37' and elevation 13° 49'. The moon ("Lune") at 02:10 a.m. The Moon was indeed in the sky. Moreover, from 02:00 a.m. to 03:00 a.m., it was low, from 22° to 13° elevation. Hypothesis 2: Was the Moon a full the Moon? If not, the Moon is not a very good explanation. If so, the Moon explanation is even better. Yes, actually it was a full moon with 93% of its visible sunlit part visible to the witnesses. Hypothesis 3: Was the Moon in front of the witnesses? If it was behind their backs, the Moon is not a very good explanation. If it was precisely in front of their eyes, the Moon is a better and better explanation. The National Road 454 or RN 454, reclassified RD 954 in 1972, was a main road connecting Recey-sur-Ource to Cussy-les-Forges. The witnesses began their observation between Epoisse and Toutry. It continued 15 kilometers further to Cussy-les-Forges. It ended when, frightened, they decided to turn their motorycles back and fled back. They thus were riding on the RN454 in the Epoisse towards Toutry towards Cussy-les-Forges direction. It is easy to note on a map that while making this drive, they were going exactly in the direction towards the Moon's position! Hypothesis 4: The UFO goes up and down, appears and disappears. If the terrain does not allow that, the Moon is not a good explanation. If the terrain allows that, the Moon is really a quite fit explanation. The Moon goes up and goes down alternatively in this observation. It "disappears" and "reappears" also alternatively. The illusion is however classic: the variation of the terrain can reveal then hide the Moon. If the Mobylettes are on top of a hill, the sight is good. If they are down in a hollow, the sight on the Moon can be very easily masked. Were they on a flat terrain? Precisely not so. This is a hilly terrain, for precisely the village of Cussy-les-Forges, an altitude indicated by the National Geography Institute indicates "minimum 265 meters" and "maximum 361 meters". A 100 meters variation. The same applies on almost all the course. This is precisely in conformity with the description by the witnesses of the thing going up, down, appearing and disappearing alternatively. What about the landed sphere of 3.50 meters diameter? Well, are there still ufologists nowadays who would not realize that absolute sizes do not count at all in such circumstances? What matters is the angular size; and it is that of the full moon. Of course, when witnesses assume that the moon landed on the road - because it could indeed have been straight ahead on the road, because it was the night, with clouds - then the witnesses assume that it is not millions of kilometers away, but as some more reasonable distance, and the witnesses believe they can express a diameter in meters. But isn't it just interesting that there is no shred of mention of the distance of sighting? Isn't this a question to ask, just in case the witness would answer that it was, say, at 10 meters of them? If the witnesses had seen a flying saucer, they must have seen it near to the Moon. They do not say whether they saw the Moon in addition to a flying saucer, which is understandable. They are not ufologists! But Jimmy Guieu was supposed to be a ufologist. Jimmy Guieu does not ask them - or if he did, he forgot to mention the answer. In an investigation, a ufologist must absolutely ask this sort of things, ask the witness(es) where the Moon was, where the most brilliant stars were, if there were, and so on! It might seem incredible that the Moon can be mistaken for a flying saucer. But the Moon sometimes takes appearances which can be disconcerting. And precisely, Jimmy Guieu states at least that the sky was partially covered! Do we even have information on the maturity of the witnesses? No! We do not even know their ages. One is an "assist-geometrician". A 16-year-old apprentice? With a 14-year-old friend? Nothing is reported on this matter, and it is to better to skip Vallée's summary that changes them in "two geometricians." Nothing is known as of their state of mind, in a period when precisely almost the entire nation was looking up in hope to see the saucers that make the headlines every day. One can only note that François Bolatre "knows" how a saucer must behave, unless pressure from Jimmy Guieu resulted in this: he assumes that once that they turned their back at it, the saucer just must have taken off. 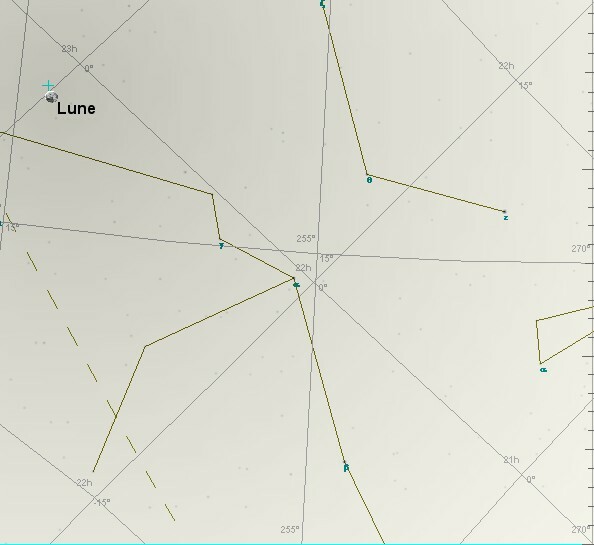 In this sighting report, all the available parameters indicate that the Moon constitutes a fit explanation, corresponding very well to the report allotted to the witnesses, an explanation simple and easy to evaluate, but an explanation that obviously had not even been considered at the time, nor since. [jg1] "Black-Out Sur Les Soucoupes Volantes", livre par Jimmy Guieu, Fleuvre Noir éditeur, France, 1956. [jg1] "Black-Out Sur Les Soucoupes Volantes", book by Jimmy Guieu, Omnium Littéraire publidher, France, pp 208-209, 1972. [jv1] Summary by Jacques Vallée in "En Quête des Humanoïdes", book by Charles Bowen, French translation of "The Humanoids", J'ai Lu publisher, France, page 48, 1974. [jv2] "Un Siècle d'Atterrissages", article by Jacques Vallée in the ufology magazine Lumières Dans la Nuit (LDLN), France, numéro 43. [jv3] "Passport To Magonia - On Ufos, Folklore, and Parallel Worlds", book by Jacques Vallée, Contemporary Books publisher, USA, page 233, 1969. [jv3] "Chronique Des Apparitions Extra-Terrestres", French translation of "Passport to Magonia", book by Jacques Vallée, J'Ai Lu publisher, France, page 274, 1972. [gl1] "Face aux Extra-Terrestres", book by Charles Garreau and Raymond Lavier, Delarge publisher, France, pp 46-47, 1975. [gl1] "Face aux Extra-Terrestres", book by Charles Garreau and Raymond Lavier, Delarge publisher, J'ai Lu, France, page 46, 1975. [pr1] "The Catalogue - An international catalogue of type 1 reports", compiled by Peter Rogerson, in the ufology magazine MUFOB, U-K., New Series #3, page 7, Summer 1976. [mf2] "O.V.N.I. et Géographie", article par Michel Figuet, dans le bulletin d'ufologie UFO Informations, France, N° 15, page 6, 4ème trimestre 1976. [fr1] "OVNI, Premier Dossier Complet Des Rencontres Rapprochées en France", book by Michel Figuet and Jean Louis Ruchon, Alain Lefeuvre publisher, France, page 141, 1979. [vi1] Catalogue in the ufology bulletin Vimana 21, of the A.D.R.U.P. ufology group, France, #17, page 16, 4th quarter 1984. [mf3] "ATTERRISSAGES D'UFO sur le continent français du 26 septembre 1954 au 18 octobre 1954", liste par Michel Figuet dans le magazine d'ufologie Lumières Dans La Nuit (LDLN), France, N° 249-250, page 26, March / April 1985. 1.4 Patrick Gross February 20, 2017 Addition [ub1]. 1.5 Patrick Gross January 24, 2019 Additions [pr1], [mf2], [vi1], [mf3], [lh1], [pr2], Summary. 1.6 Patrick Gross April 20, 2019 Additions [mf1].